Come visit world's most beautiful pool hall in Wan Chai, Hong Kong. The history of billiards is obviously a very old and lengthy one. Billiards has been played by all sorts of people from all sorts of continents and countries. Joe has been a fanatic snooker and 8-Ball player since he was introduced to the sport during his studies in US. 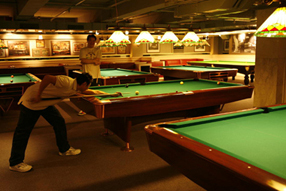 January 6, 2006 was the day his dreams came true when he officially opened a world class billiard parlor in Wan Chai. We are hoping to provide a place for 9 pool tables, 2 burnswick, 7 olios, fanatics a place to practice and have fun. Other than 8 tournament quality pool tables, we feature more than 100 pieces of antique pool collectibles and movie stills with Hollywood stars playing pool. 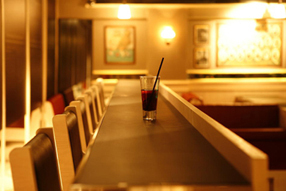 Everybody is welcome to spend his/her happy hours at our stylish and friendly bar, or better yet give it a shot on our challenge tables, only the winner gets to stay. Projector and large screen TVs are cable ready for optimal sports viewing pleasure. come Eat, Drink, Play at Joe's Billiards & Bar.